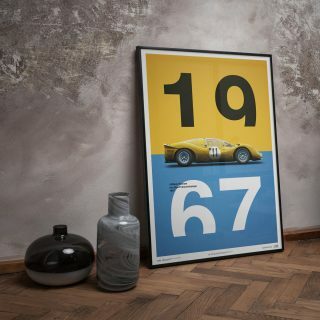 We have quite a few artists and their works in the Petrolicious Shop, but we can’t help having our own list of favorites, and Automobilist, a division of Unique & Limited, is a name we’re always happy to see show up in our inbox with new pieces to share. 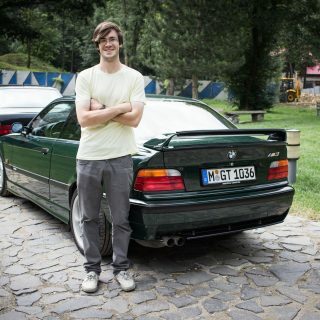 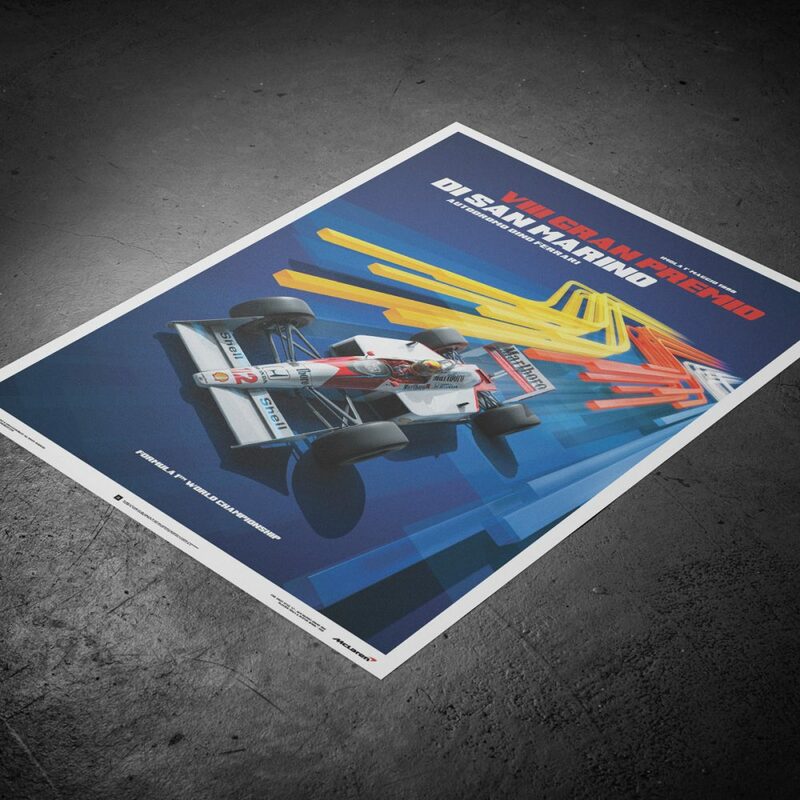 If you aren’t familiar with what sets these guys apart from other talented graphic artists, they go through an ambitious and time-consuming rendering process for each car they feature. 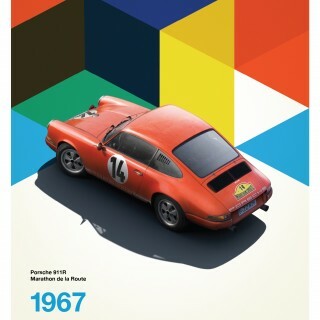 The models they create on the screen are then given a careful application of textures and liveries and further details down to specks of road grit, before being placed in the poster’s larger context. 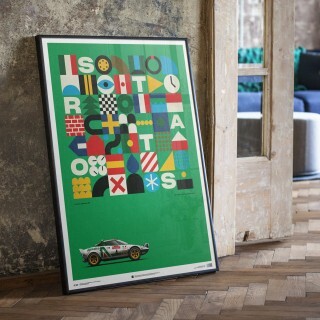 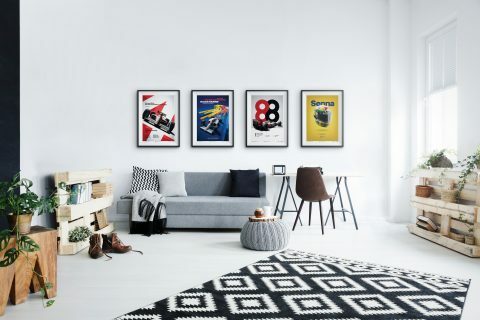 The completed pieces ooze vibes of classic racing posters with their confident and brash yet simple blocks of color, while the cars nestled within the frame are a bit more modern looking, gleaming with the perfection afforded to us by today’s computer programs. 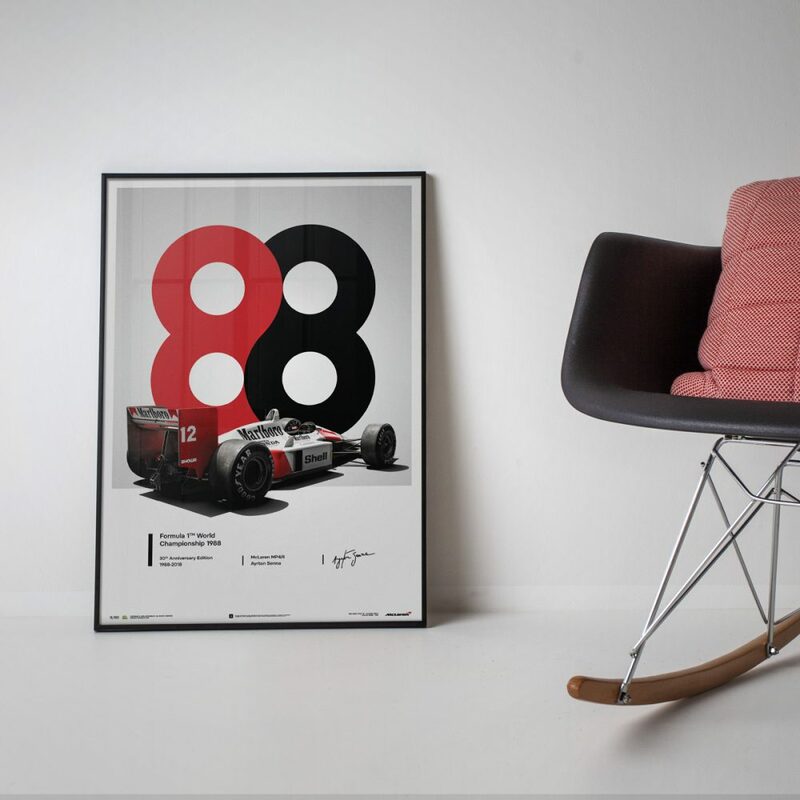 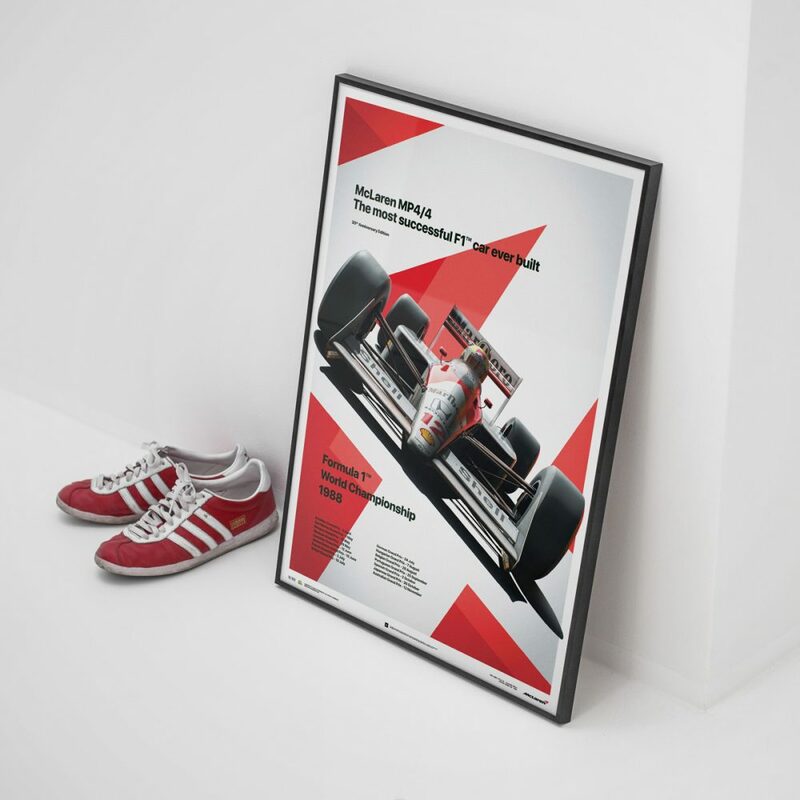 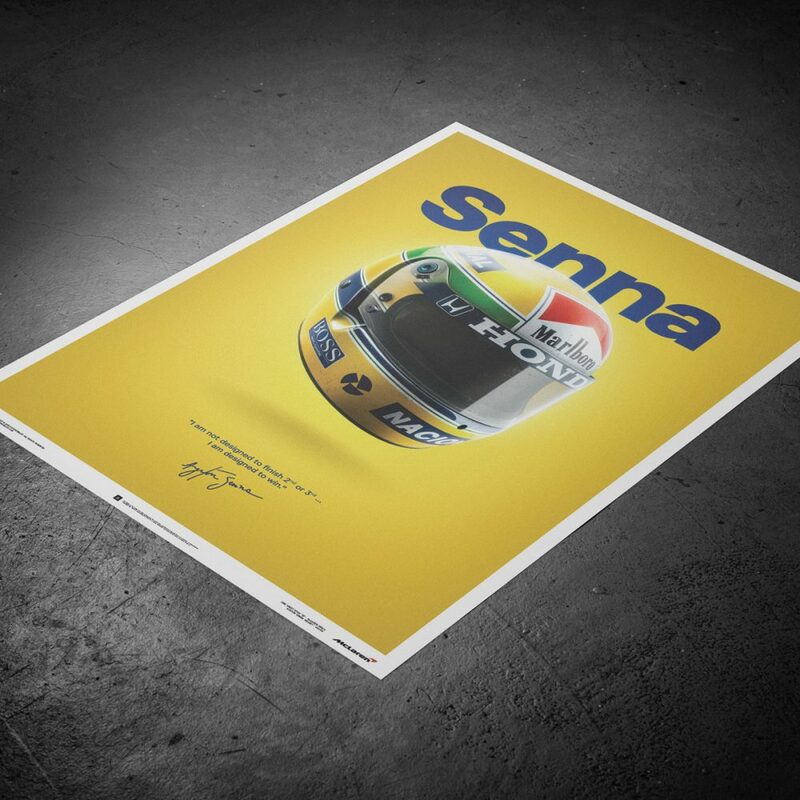 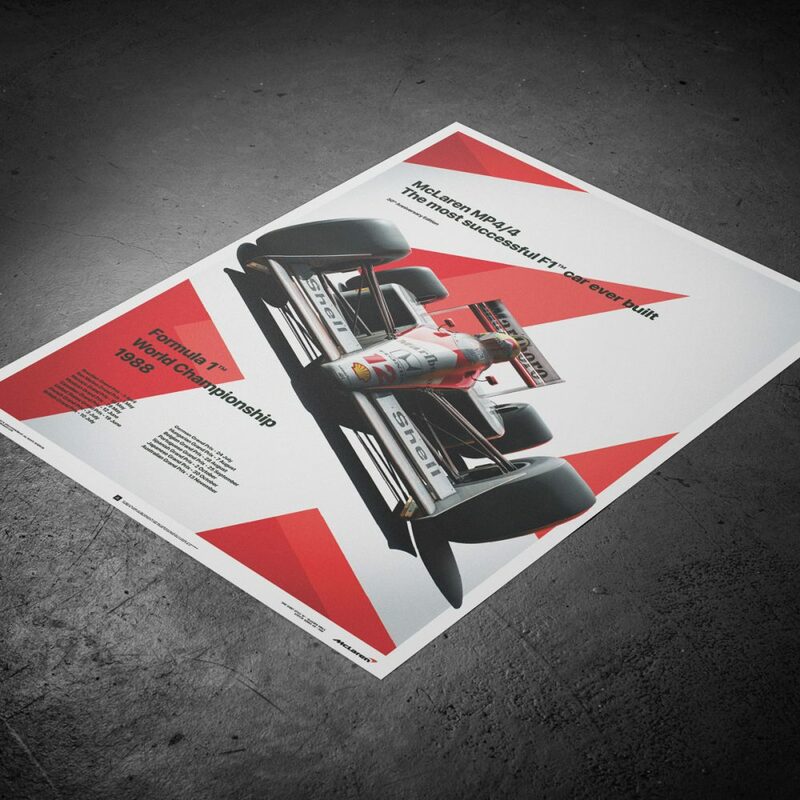 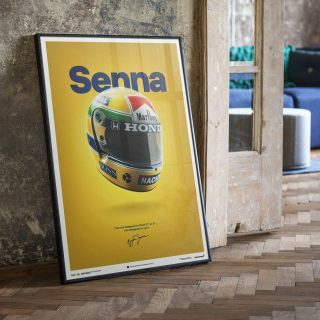 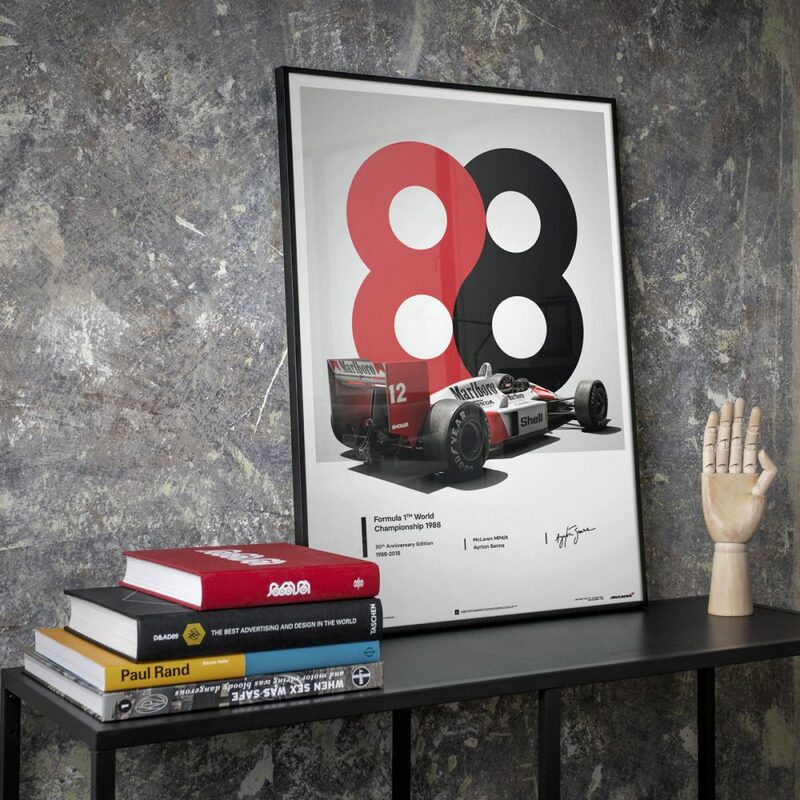 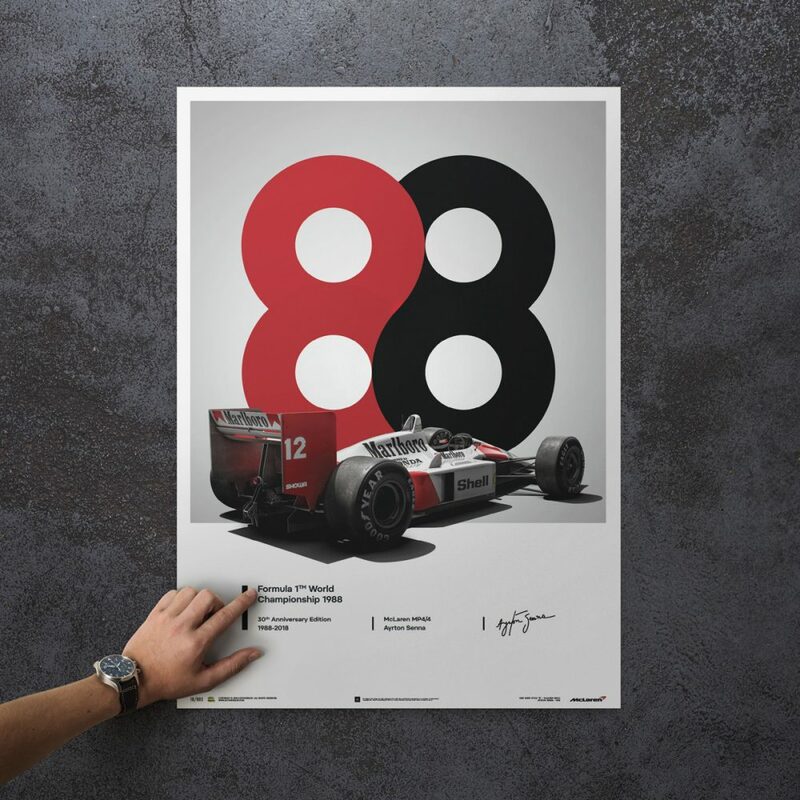 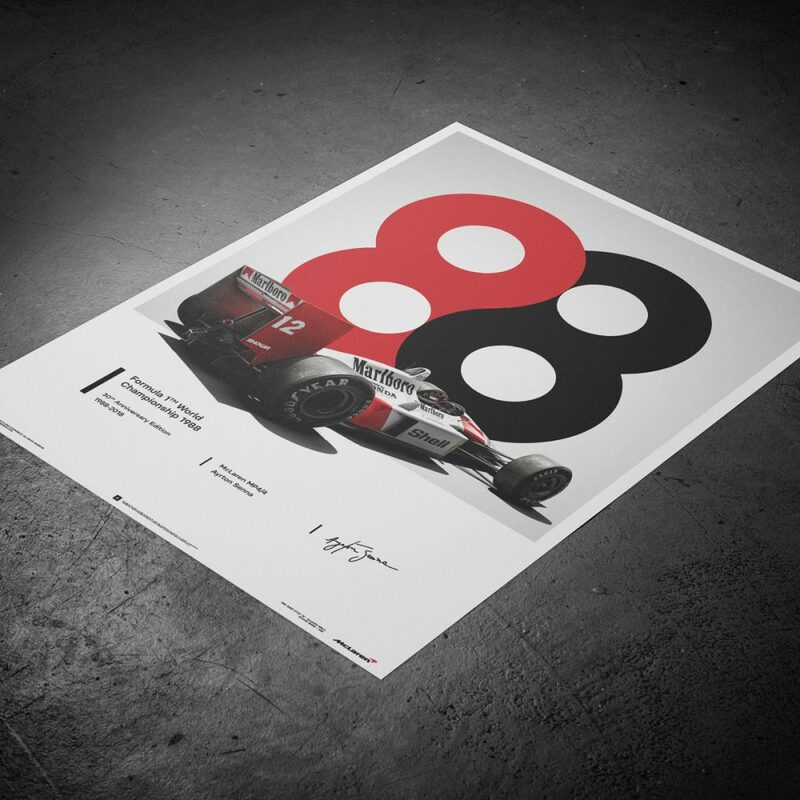 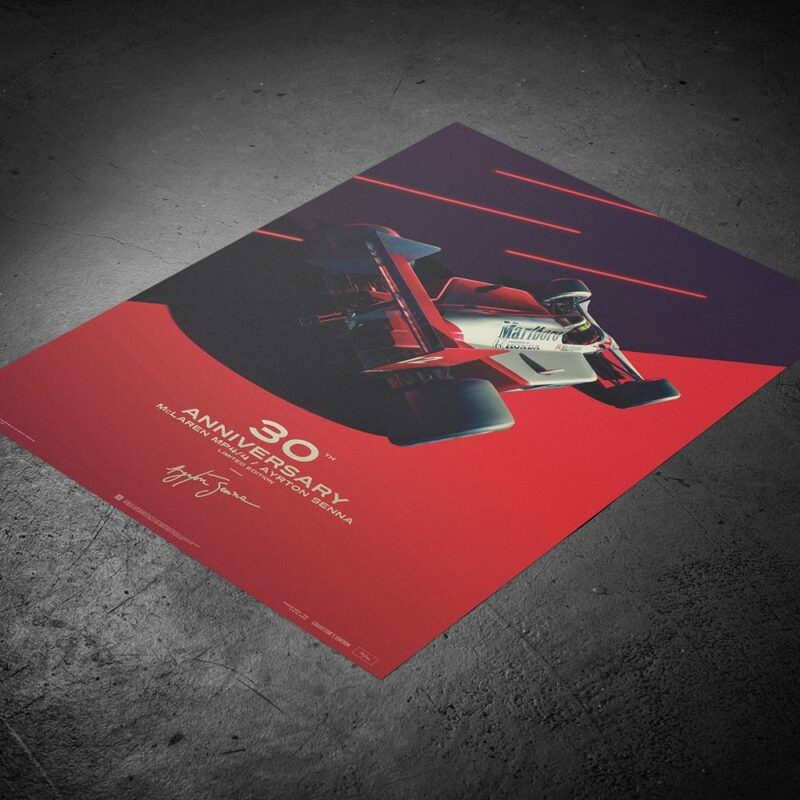 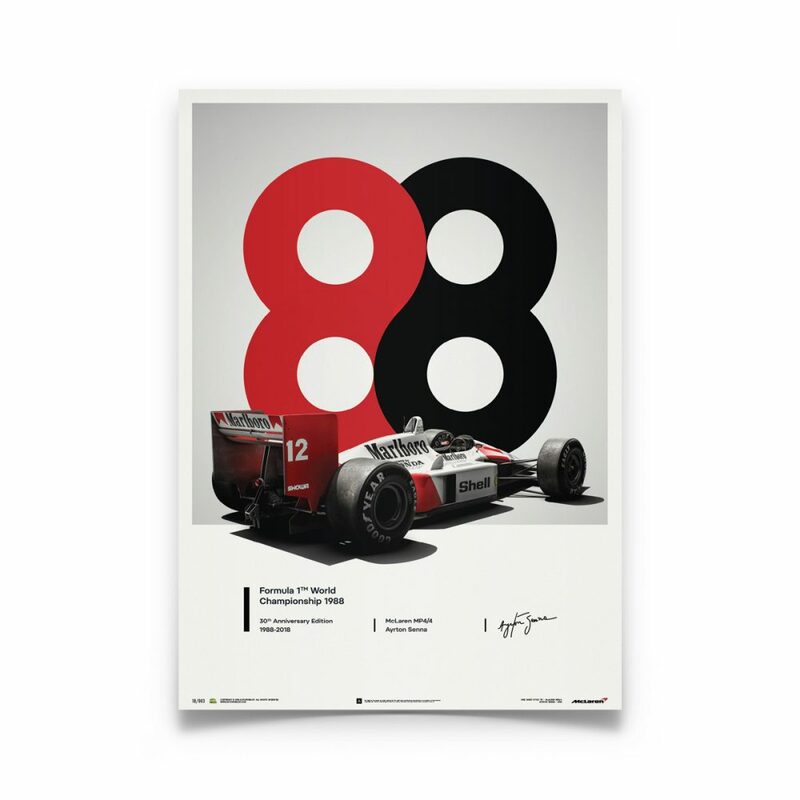 Their latest series of work is the result of McLaren approaching the artists to collaborate on a set of posters that celebrate Ayrton Senna’s first World Champion season in 1988, and the result is five posters (one a limited edition) dedicated to the pairing of Senna and his dominant McLaren MP4/4. 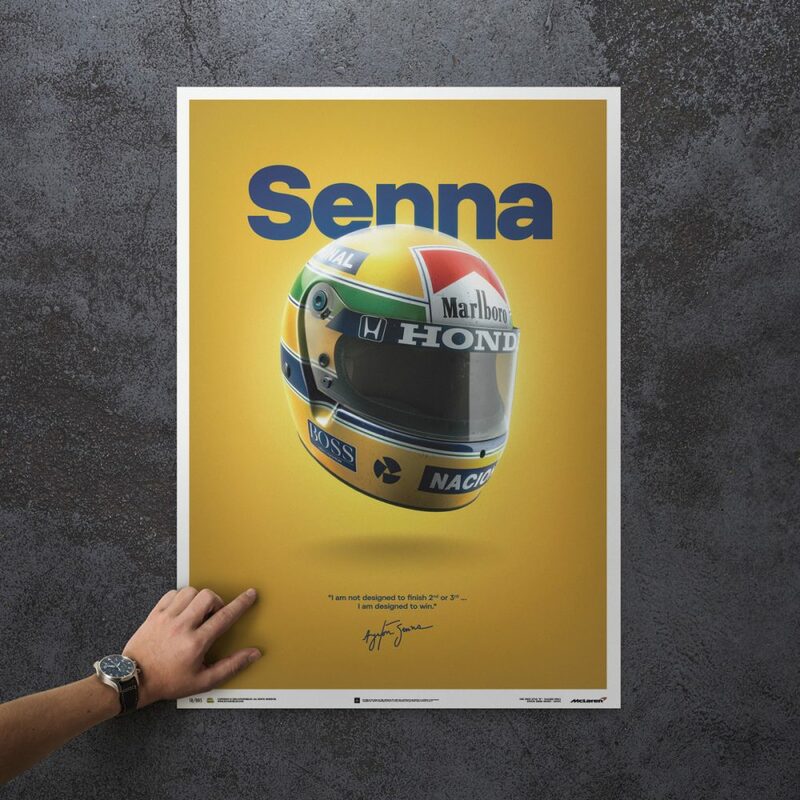 Each is an officially licensed product of McLaren Racing Limited and the Senna Foundation. 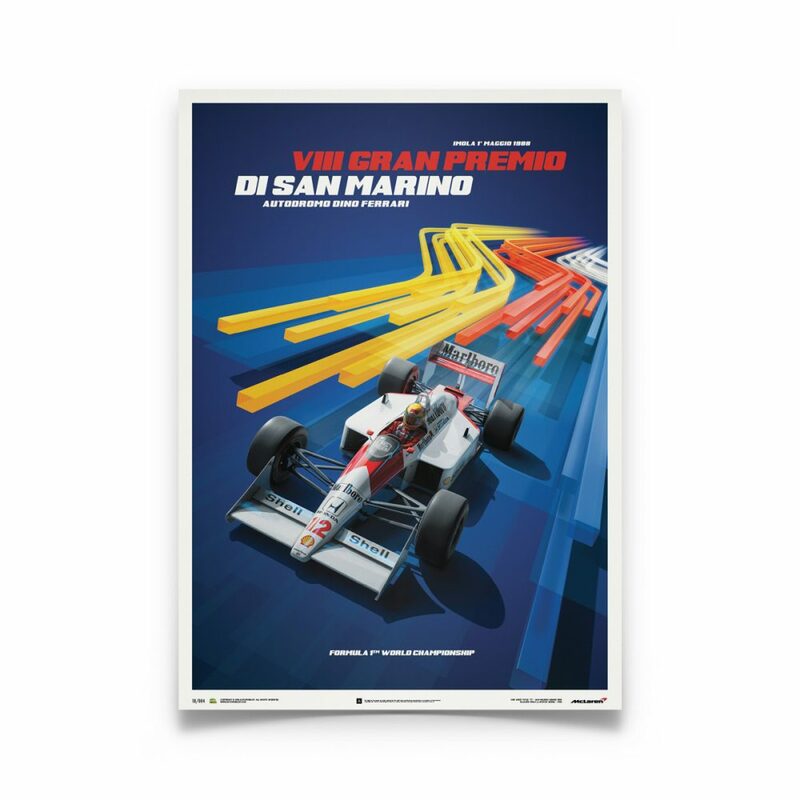 First up is the San Marino GP poster, recalling the first race of the season that saw Senna as the victor. 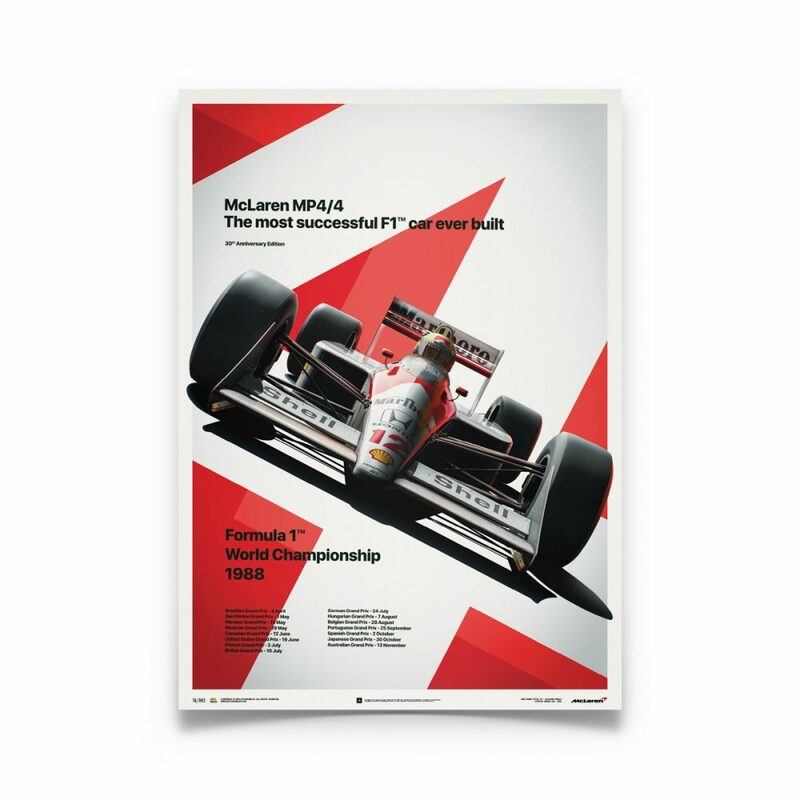 It was just the second race of the season, and for the rest of 1988 there was only a single race wherein Senna nor his McLaren teammate Alain Prost stood on the top step of the podium. 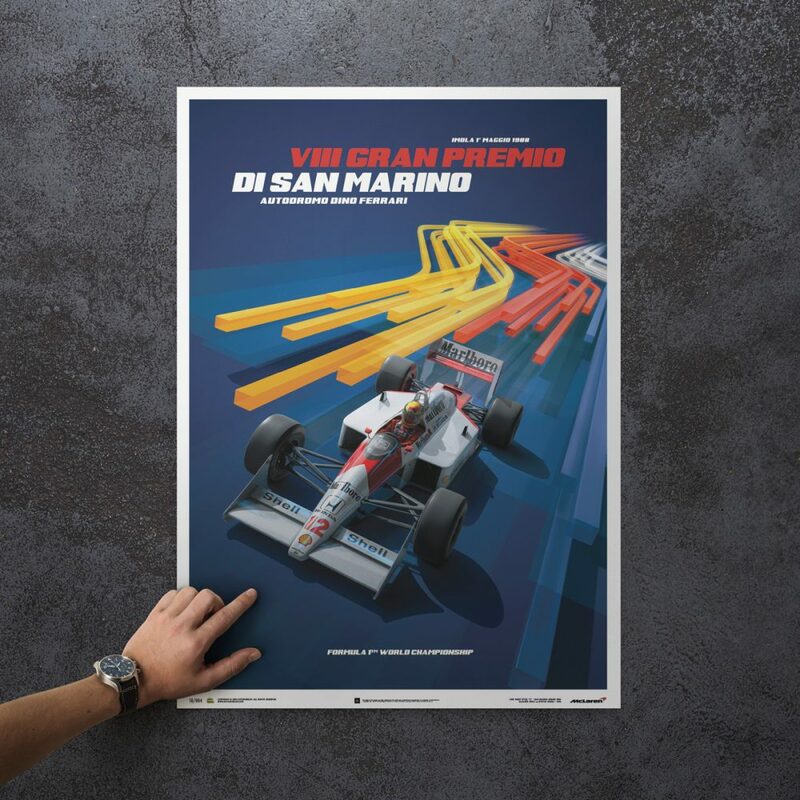 San Marino may not have the mythic quality of Senna’s drive at Monaco, but it did mark the beginning of a commanding winning streak that was almost, but not quite, matched by his French teammate. It’s was 30 years ago when Senna earned his first World Championship, and the poster above depicts the business end of the car that helped him get there, with the simplified and stylized ’88 in the background lending some nice juxtaposition to the highly-detailed MP4/4. 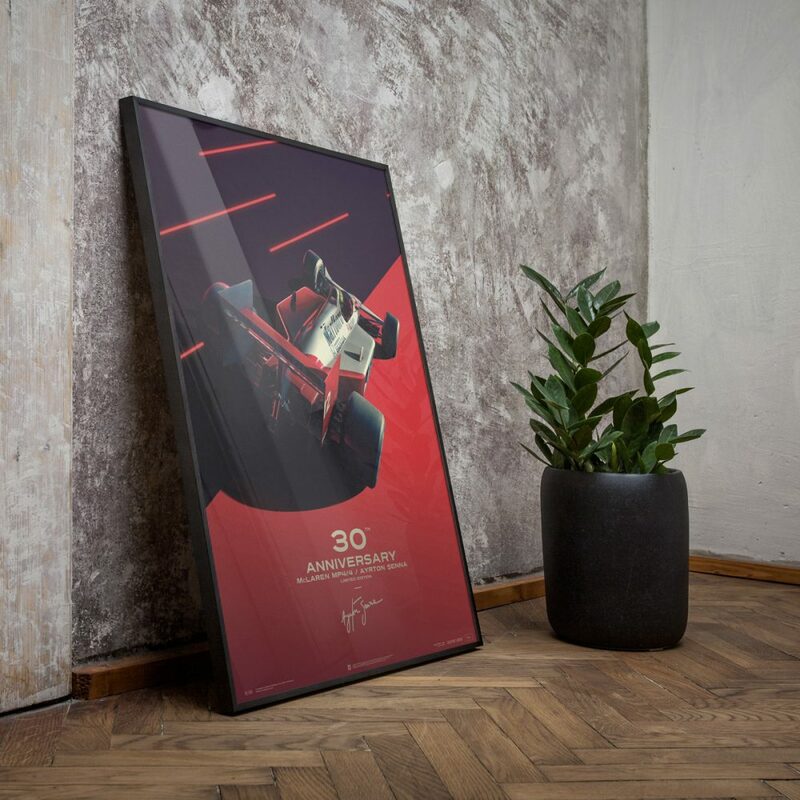 When Automobilist creates a literal poster car, they spend many more obsessive hours creating it in 3D from scratch than we ever did looking at the ones tacked to our bedroom walls; the payoff from this meticulous work is an exceptionally realistic McLaren for them, and a new poster to ogle for the rest of us. 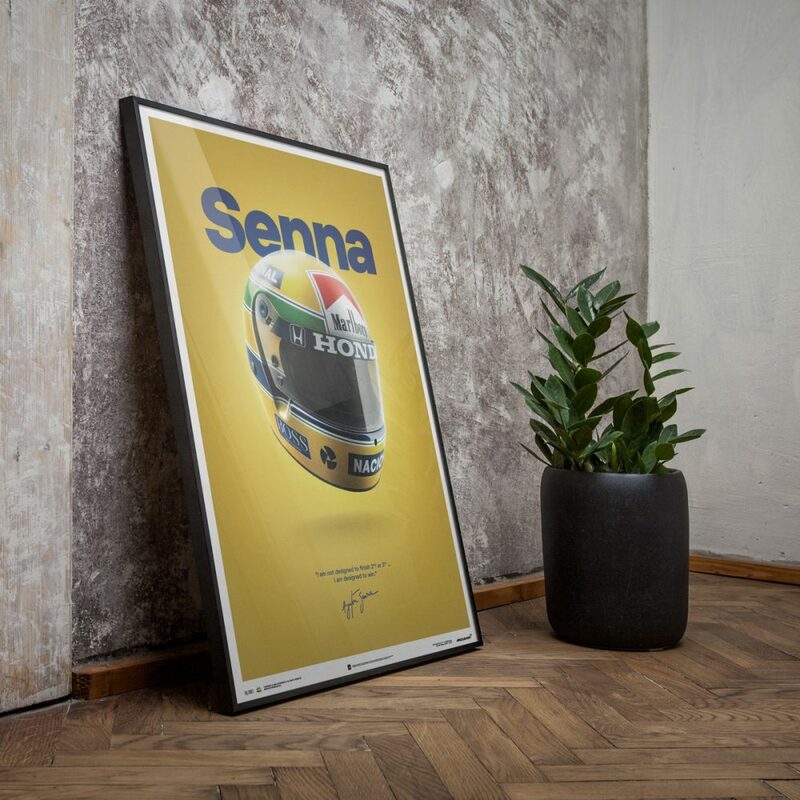 Perhaps even more than a car in some cases, a racing driver’s helmet is what we envision when their names pop into our heads. 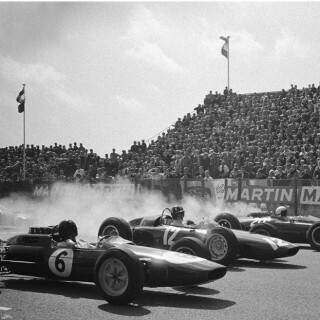 When they’re milling about in the pits or hiding from the fanfare in their tents and trailers we see their likeness as people, but when they’re in the cars that let them do inhuman things on a racetrack, the helmet poking up and out of the snug cockpit becomes their identity. 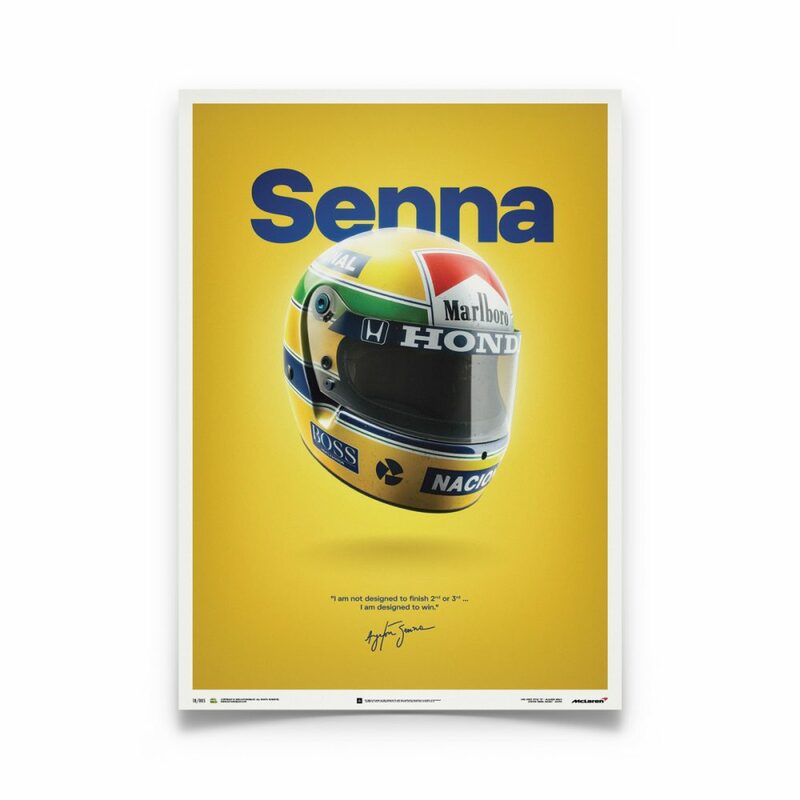 And of all the iconic buckets out there, Senna’s bright yellow Brazilian-schemed lid is up there with the most well-known in this sport or any other for that matter. 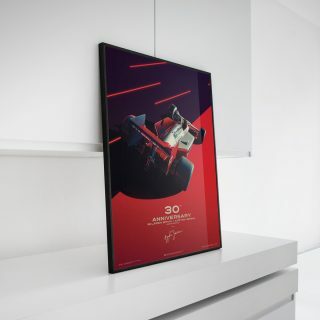 Commemorating the car more so than the driver in the print above, Automobilist has placed the MP4/4 at an aggressive angle inside the oversized “4” that fills the space behind it, evoking a sense of velocity from the a view rarely seen by anyone on the lead lap: the front of Senna’s McLaren. 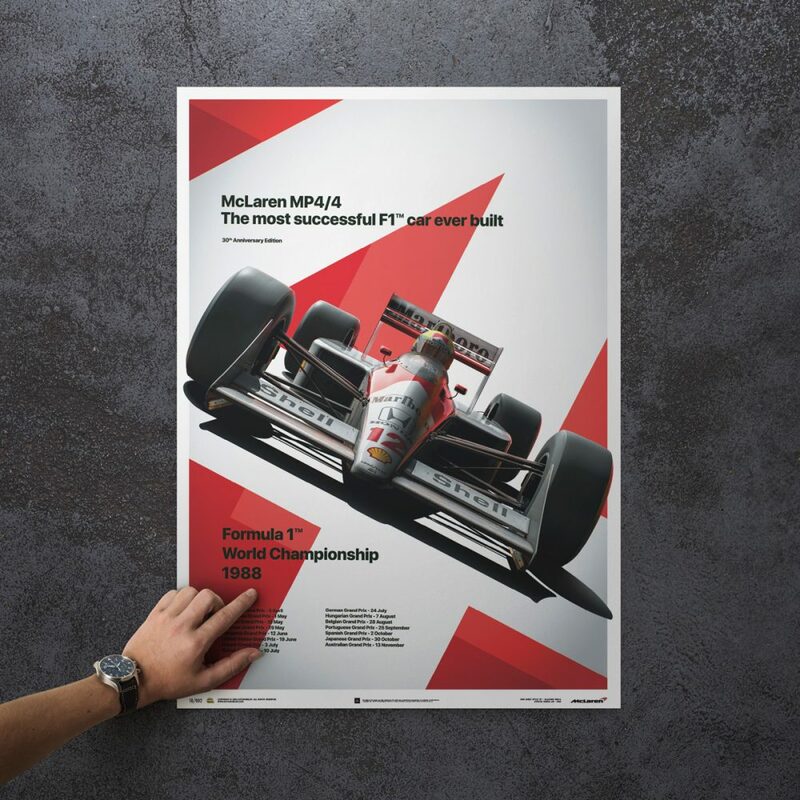 Designed by Steve Nichols and Gordon Murray of Brabham and McLaren F1 (in both senses) fame, the car only competed for a single season, but in doing so it became the most accomplished competitor in grand prix history, securing every pole position but one, and winning every race but one in 1988. 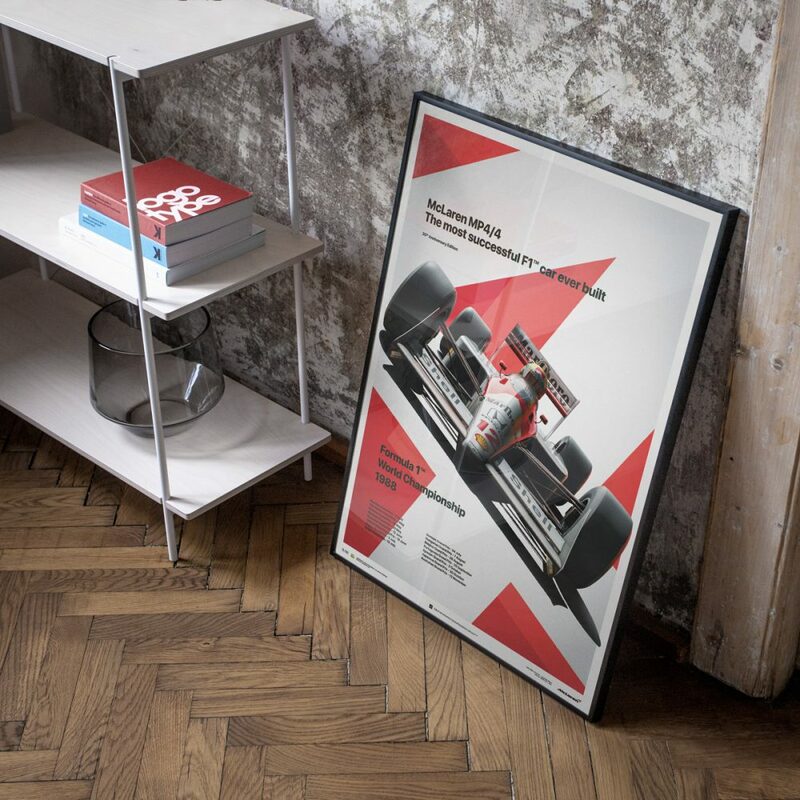 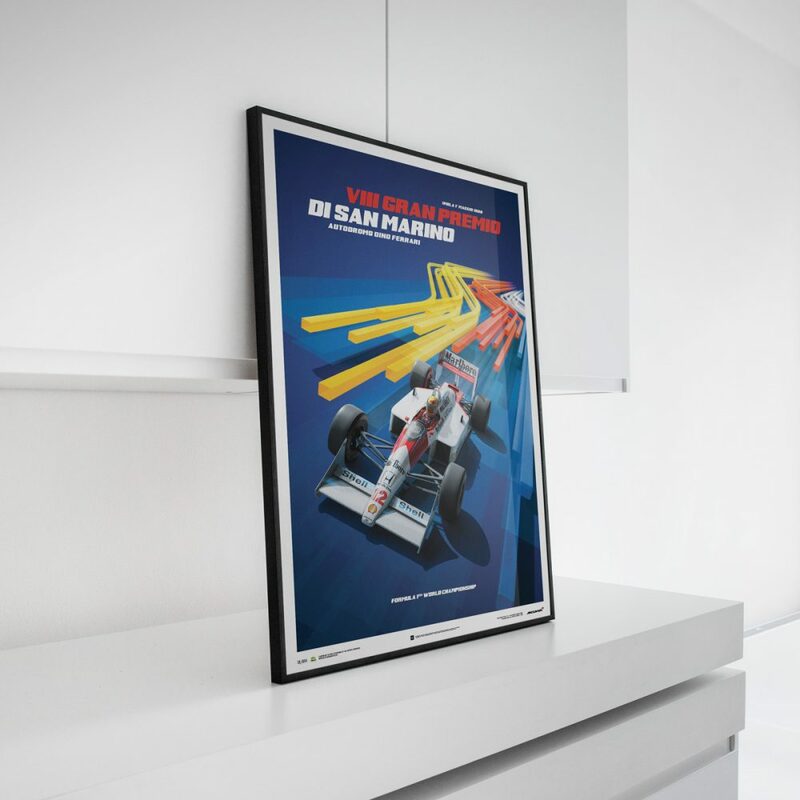 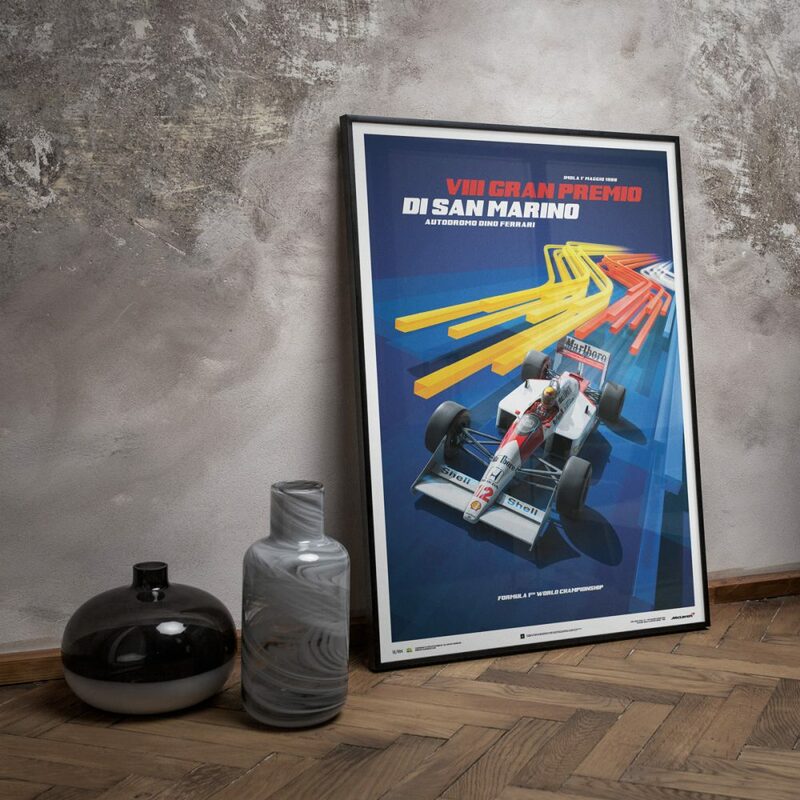 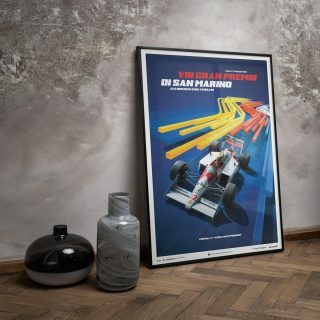 To complete the McLaren-Senna series is this limited edition poster featuring the MP4/4 he used to win in San Marino, complete here with every sidepod scuff and speck of dirt worn by the real thing three decades ago. 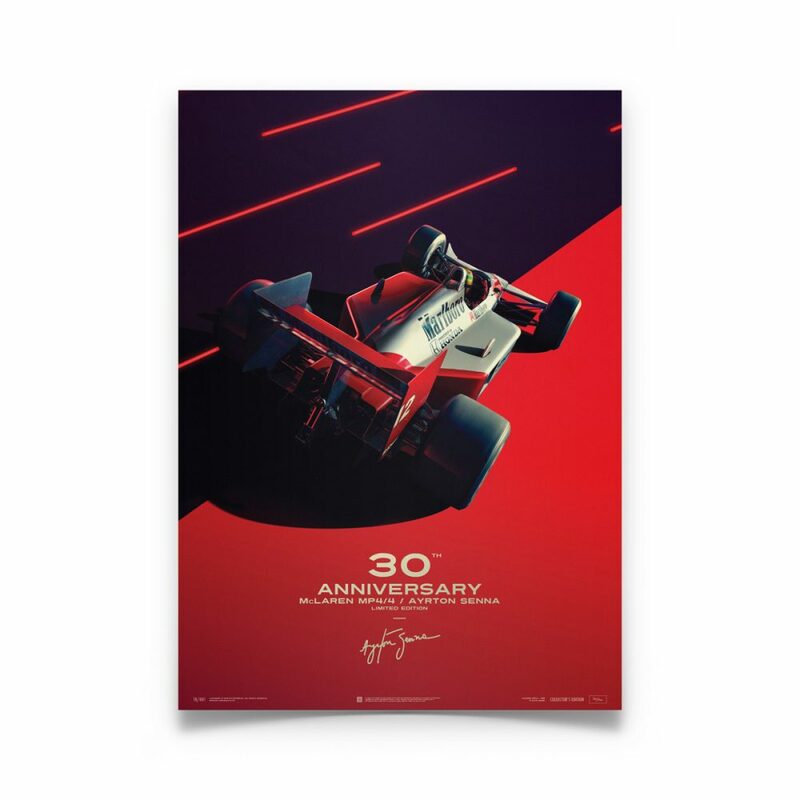 The design of the poster itself suits the theme well if you interpret the solid strake of red as the mortal plane and the streaked violet above as the realm beyond that, the one in which it seemed Senna did most of his driving. 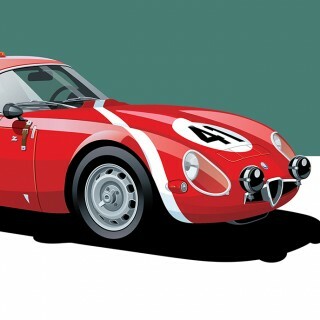 It’s a definite challenge to choose such beloved and famed subjects to turn into artwork, not the least bit because it’s been so many times already. 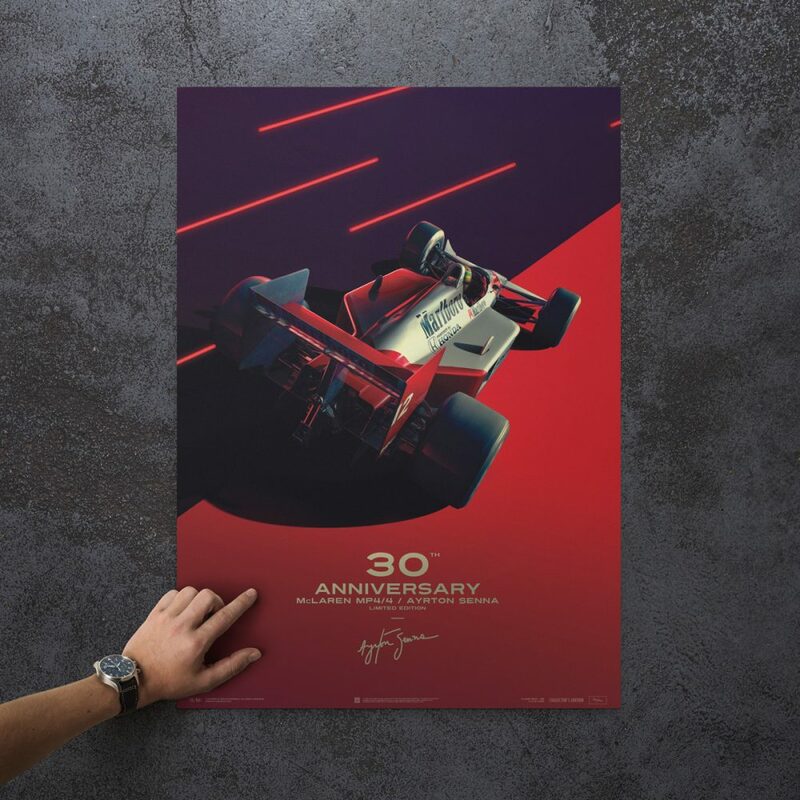 The collection here however brings in a novel view of this legendary man and his tool, achieved through a balancing of intricate detail and stylishly simple layouts—a fitting and beautiful way to commemorate the 30th anniversary of a truly magical pairing.